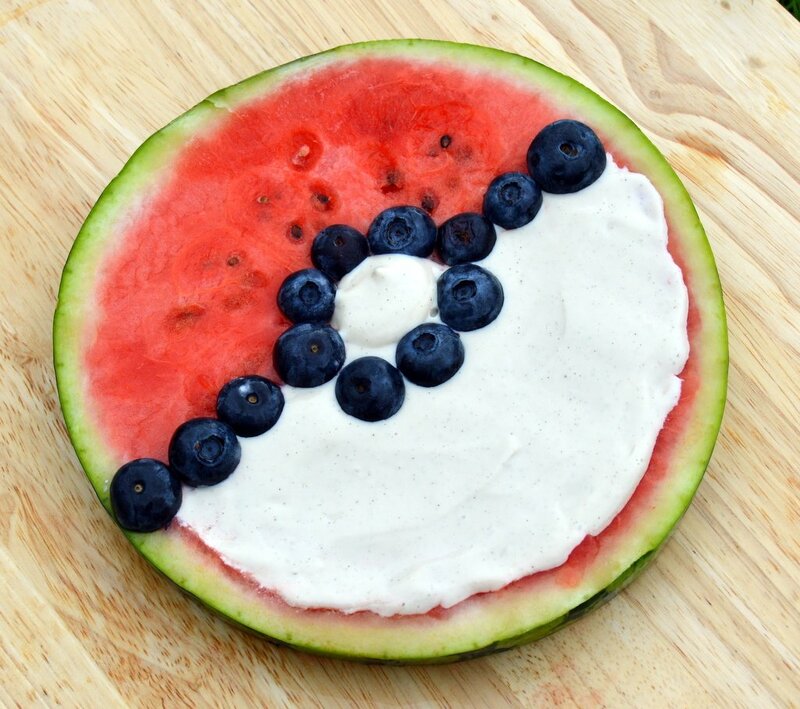 A quick delicious and healthy Pokemon Fruit Pizza that looks like a Pokeball. 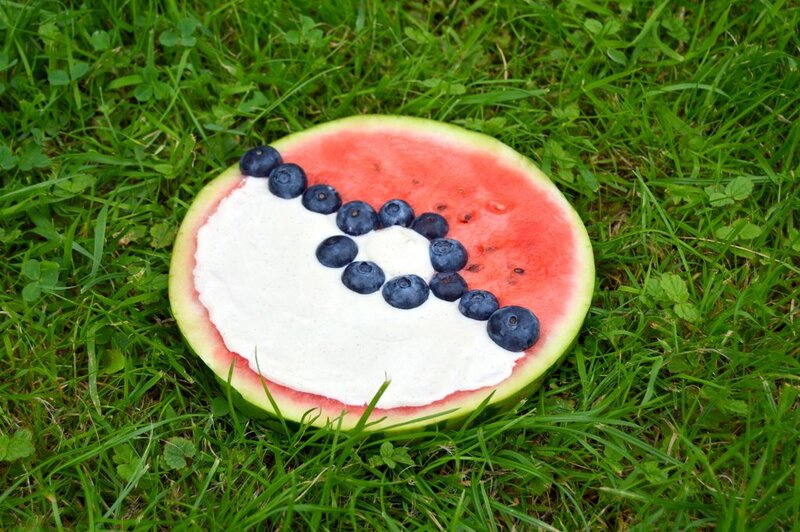 It’s made from a slice of watermelon topped with cashew vanilla cream frosting and blueberries. You can sub the blueberries for any other dark berry, just remember to cut them in half else they will roll everywhere. The blueberries and cashew nuts all count as a portion towards your fruit / veg. It does have 1 tablespoon of a sweetener of your choice (I recommend maple syrup or date syrup) but you can leave this out if you prefer and it will still taste great. It’s vegan, dairy free, gluten free, refined sugar free and most importantly tastes as great as it looks. 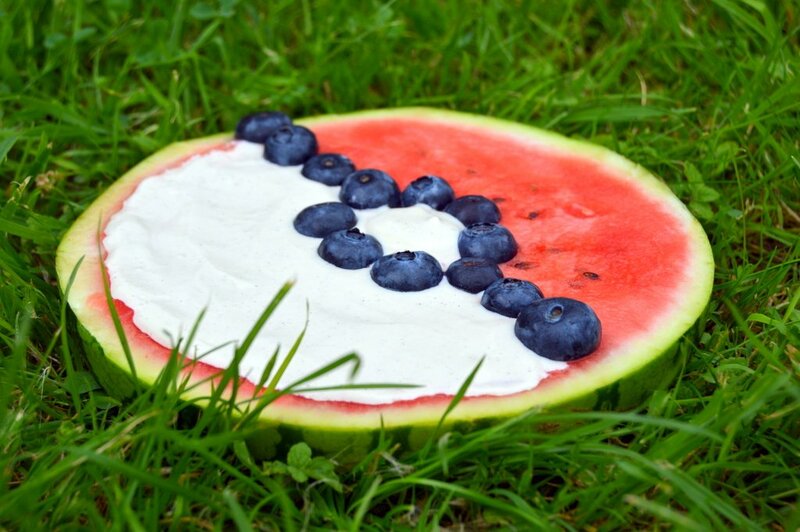 Watermelon, 1 slice. I tend to do about 2-3 cm thick, but what ever works for you. Cut out ever so slightly the sections that will be white. Blend all the other ingredients (except the blueberries) together, add enough water to allow the blender to whizz the frosting smooth. Pour the frosting into the cut out section. Cut all the blueberries in half and then use to mark out the sections. I LOVE THIS THING SO MUCH I HAVE IT IN SCHOOL FOR PRESENTATION!!!!! !